This Yulong D100 II is the latest and newest upgraded model from the previous popular Yulong D100 model. 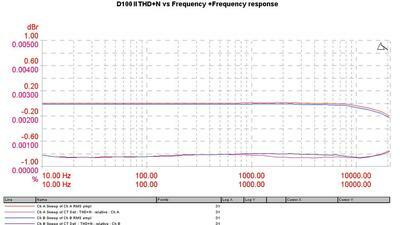 The D100 II is a high-precision audio decoder. Thanks to it's plenty interface, excellent performance and small size, it is very convenience to integrate into your Hi-Fi system. Based on the D100, the digital USB input has been upgraded to TE7022L chip which support 24/96kHz high res signal, and works with Yulong proprietory ASIO driver for the best possible sound quality out of your computer. The part of the headphone amplifier is readjusted to the more plump sound. In comparison with the D100,it is more practical! ● Sophisticated design, adequate test and leading test equipments ensure outstanding result: THD+N<0.0005%, -130dB idle noise and up to 120dB SNR. ● By implementation of ASRC, we have achieved an excellent anti-jitter performance. 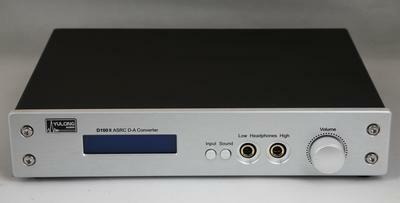 The input digital audio signal is ASRC processed to 132KHZ with reference to a custom made, 1ppm precision and low phase noise clock source. The output is an extremely low jitter I2S signal to feed into the DAC chip. That results in a very precision digital to analog convert process and not sensitive to input signal quality. So a stable result is maintained within different of front end equipment. In our test, when the input digital signal is added 80ns of jitter, this DAC can produce almost same performance as when there is no jitter added, while another DAC in comparison which is not implemented with ASRC already lost the lock to the signal and cannot work. ● Carefully designed analog circuits, together with the long time listening compared components, bring to the neutral and fine textured sound quality. 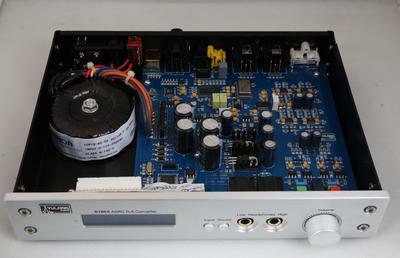 In general, the DAC is high resolution, extended dynamic and with an extensive sound image. ● The USB interface uses the TE7022L (Supports the ASIO and the USB2.0), the I2S signal from this chip is sent for ASRC and DAC. 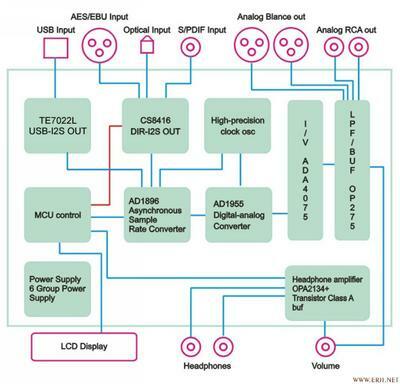 It can achieve the same performance index as the S/PDIF, Optical or AES/EBU inputs. The THD+N is less than 0.0005%. ● This DAC carries a high performance headphone amplifier, and sound style is selectable by pressing the Sound button on the front panel. The default style Mode 1 is natural and dynamic. Switching to Mode 2 will result in a smooth style, which is suitable for bright headphones, or if you prefer more "dark and smooth" sound. ● Two headphone outputs with different impedance: LOW is suitable for headphones with low impedance and high sensitivity such as in ear monitor; while HIGH fits most of bigger headphones. You can also try to get a different sound style by using a same headphone in different outputs. ● Easy operation: Most likely you only need to access the MODE button on the front panel. 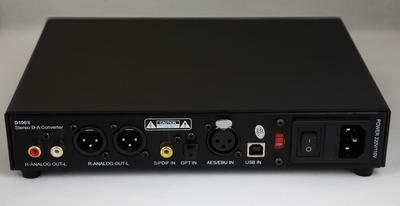 The last used input channel is stored automatically and will resume when power up. So plug and play your music. ● High quality aluminum housing, custom made gold plated connectors result in a flawless operation, a robust connection and a superior reliability. ● No matter where you are: You can select 110/120V or 220/240 operating voltage. The digital input includes Optical, S/PDIF and AES/EBU, which can connect to most of the equipments with PCM digital audio signal up to 24bit/192KHZ, such as CD, DVD or sound card. By selecting USB mode by pushing the INPUT button on the front panel, this DAC can be used as a USB sound card, and supports WINDOWS 7, VISTA, XP, MAS OS and LINUX. The unbalanced RCA coaxial line level output and the balanced line level XLR output on the back panel can connect to amplifiers or active speakers. And the Headphone output on the front panel can connect to headphones with impedance from 16 to 600 Ohms. WARNING: Both of the RCA and XLR line level outputs are NOT controlled by the Volume knob on front panel, and as always in full output level. Any equipment connected to these outputs must has a proper volume control, otherwise might be damaged. It might harm the hearing of audience too. We are not responsible for any kind of such results. If you want to use the ASIO, it is needed to install the special ASIO drivering program for the D100 II. Recommendation: Uses the USB to connect the D100 II, in order to get the best result, you can adjust the volume of PC to the maximum and change the setting of the player to the format 24Bit/96KHz. Note: One year free warranty. The warranty is void, if the DAC is opened not by us.